The Question: On two different occasions we have retrieved similar strange objects floating in the lake we stay at in New Hampshire. 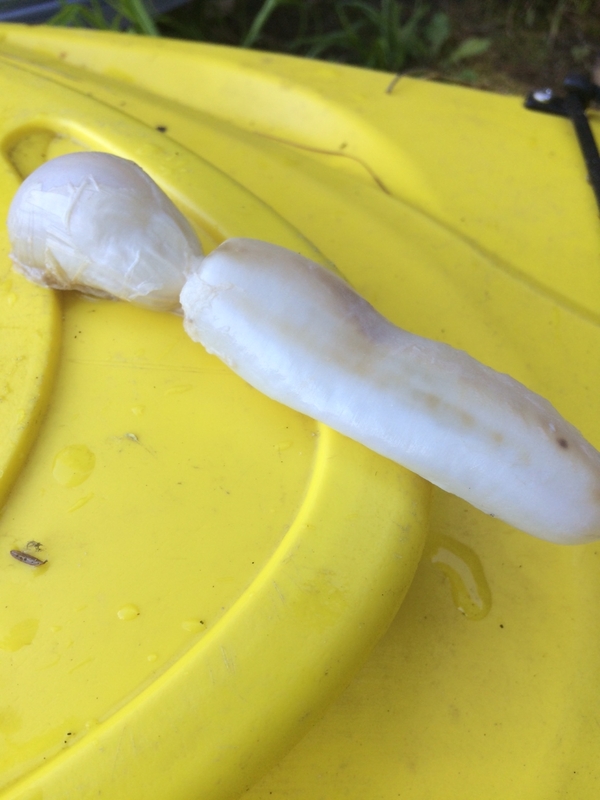 I know it looks like it could be latex or some other man-made material-but it had a fleshy feel and no openings that could be seen. We did not cut it open. It had a bit of a fishy smell. It was about 13 cm (5 inches) and more like flesh than a plant. What are these? The Short Answer: I didn’t recognize these UFOs (unidentified floating objects) right away, but I’m guessing there are some fishermen out there who would. When I started trying to imagine what kind of natural object from a northern lake would float, it suddenly occurred to me that the swim bladder of fish would qualify (also called air bladders or gas bladders). Swim bladders are air filled sacks in the body that help a fish maintain neutral buoyancy in water. Most of the large game fish Alison could find in a New Hampshire lake, such as bass or pike, have a swim bladder with a single bulb, but carp have a bladder that is in two parts, just like the ones Alison found. My guess is that someone in Alison’s lake is catching fairly large carp, cleaning the fish by removing the internal organs, and dumping those organs in the lake. Most of the guts probably sink immediately and are eaten by scavengers. But the swim bladder, if it hadn’t been punctured, would float. And that’s what Alison found. When I sent Alison a photo of the swim bladder of a carp, she immediately agreed it matched her UFOs. Which came first, lungs or swim bladders? Anatomists long ago figured out that the lungs of some fish, the lungs of land vertebrates and the swim bladders of most fish are all homologous, meaning they develop in the same place in embryos as bulges on the pharynx, the tube that connects the mouth to the rest of the digestive system. That suggests that one of the organs evolved from the other, or they both evolved from the same earlier organ. Since we think of land vertebrates as “higher,” and more evolved organisms than fish, the natural assumption is that lungs evolved from swim bladders. 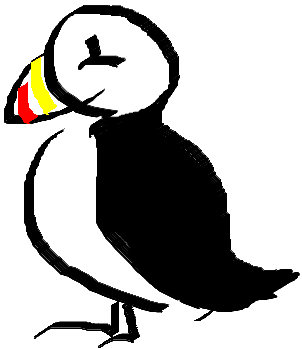 In fact, Charles Darwin himself made that suggestion in On the Origin of Species. But as evolutionary biologists looked deeper, it appeared that lungs may have come first in early fish that probably lived in shallow, oxygen deprived water. Because air holds far more oxygen than water, gulping air, as some fish do today, would have given these early fish the ability to survive in water with low oxygen. Over the generations, fish that had a pocket in the esophagus that held air did an even better job at gaining oxygen. Natural selection eventually led to fish that had actual lungs as modern lungfish do. And all land vertebrates, from salamanders to people, are evolved from those early air breathing fish. But that same apparatus that provided oxygen could also affect buoyancy, and for some fish, that may have proven to be even more useful than lungs because it would have allowed them to venture off the bottom of the ocean or river with minimal effort, opening up enormous expanses of water that had been a struggle to reach for fish that would otherwise sink. And over time, natural selection favored those fish with more and more effective swim bladders. Most fish, however, have swim bladders that are closed off. They fill the bladder by diffusing oxygen and other gasses from the blood into the air bladder, or absorbing them back into the blood. This system is less rapid than gulping, but it allows for the swim bladder to be regulated at any depth, without the need to surface. In fact, there are fish that can “pump” gasses into their swim bladders even against the enormous pressures of the deep ocean. Sharks and rays, by the way, are part of a relatively small group of fish that don’t have swim bladders. Swim Bladders and Beer: Commercial beer and wine manufactures often use a produce called isinglass to clarify their products. Because the yeast used to ferment beer and wine tend to float easily in water, particles of yeast can give the product a cloudy appearance. If you wait long enough, the yeast will fall to the bottom of the container, at which point, you can siphon off the clear liquid above. But long ago, brewers realized that certain types of natural collagens, the structural protein that makes up a large part of animal bodies, when mixed with newly made beer and wine, will cause the yeast to clump together and settle out more quickly, clarifying the beer or wine. The collagen you get when you process fish bladders, called isinglass, is especially good at this. And fish bladders are a fairly cheap commodity, since there are enormous numbers of them that would otherwise be wasted when commercial fishing catches are cleaned. So the next time you drink a glass of beer or wine, remember the connection to Alison’s strange floating objects and wonder about the irony that an object designed by nature to float, does such a good job at making yeast sink. Sources: Thanks to Sarah Longo, a PhD candidate who studies fish evolution at the University of California, Davis, for her help. Longo S., Riccio M., McCune A. R. 2013. Homology of lungs and gas bladders: Insights from arterial vasculature. JOURNAL OF MORPHOLOGY. Volume: 274. Issue: 6. Pages: 687-703. Cite this article as: Pelletier, TC. (August 22, 2015). What is this strange object floating in our lake? 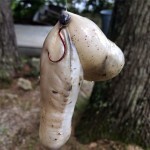 Retrieved from http://askanaturalist.com/strange-object-floating-in-our-lake/ on April 21, 2019. Previous PostHow fast do the tiny toads grow?Next PostCan animals evolve to be shape-shifters?